The other day I was trying on pants in a store’s dressing room and the tag got caught as I was pulling the pants up. No biggy right? Happens sometimes, *shrug*. Well! As I was pulling the pants up, I felt the tag scratching me but ignored it, not like it could actually hurt me, right? Oh how wrong can a girl be? My leg hurt, quite a bit, and me being me I ignored it. But eventually I got in the shower and then experienced a new pain level on my leg, always fun! I took a look and what I thought would be a tiny scratch is actually quite a long, mean looking, cut. Later that night I was prepping my hot water bottle, don’t judge, I am cold all the time so I take a hot water bottle to bed, there’s no shame in that! I either boil water in the kettle, let it cool a bit, and pour that in to my hot water bottle or I put water in the kettle, turn the kettle on, but listen for when it is almost but not quite at boiling, I turn it off and put that water in the hot water bottle. This particular evening I stopped the water before it reached boiling point and was pouring it in to the hot water bottle when oops! I slipped and poured near boiling water over my fingers. I made that sound you make when all of a sudden pain due to extreme temperature happens but did I immediately stop what I was doing so I could put my hand under cold water? No. Don’t be daft. Of course I didn’t. I finished pouring water in to the hot water bottle then closed the lid, then dried the outside of the bottle, then I tended to my hand. I put my hand under cold water. I decided I couldn’t stay like that forever, there was a bed calling my name and a hot water bottle that was getting cooler with every passing minute to think about. So I grabbed an ice gel pack thingy from the freezer, a small towel to put between my hand and the ice gel pack thingy, and headed to bed. I sit and read or watch YouTube videos while laying in bed and why mess with routine just because your hand feels like it is on fire? Me, laying in bed, partially upright so I can read, my legs bent so I make a tent with the blanket so the cat can go under the blanket (that is his night time routine), the hot water bottle on my tummy area (cause it is cozy), a book in my left hand, my right hand resting on my chest area with a cold gel pack wrapped around it. The gel pack didn’t seem to be helping all that much. It caused more pain, or maybe that was the burn just getting more painful…hard to tell, *shrug*. Two of my fingers were red and swollen and had that glossy look to the skin that burns tend to get and I thought for sure I was going to wake up with blisters. This is why I can’t have nice things, sigh. Well, the new look of the flipping thingy lasted until the second time I used it, then I accidentally rested it against the hot part of the frying pan and melted part of the handle, oops! See, the part you can see in the picture is silicone (I think! ), whatever it is it doesn’t melt when touching the hot frying pan, a little farther up though the handle changes and is made out of rubber and that part isn’t quite so immune to heat, sigh. Not only did I melt part of the handle but the melted part then become one with the edge of the frying pan. It was like two worlds merging in to one. 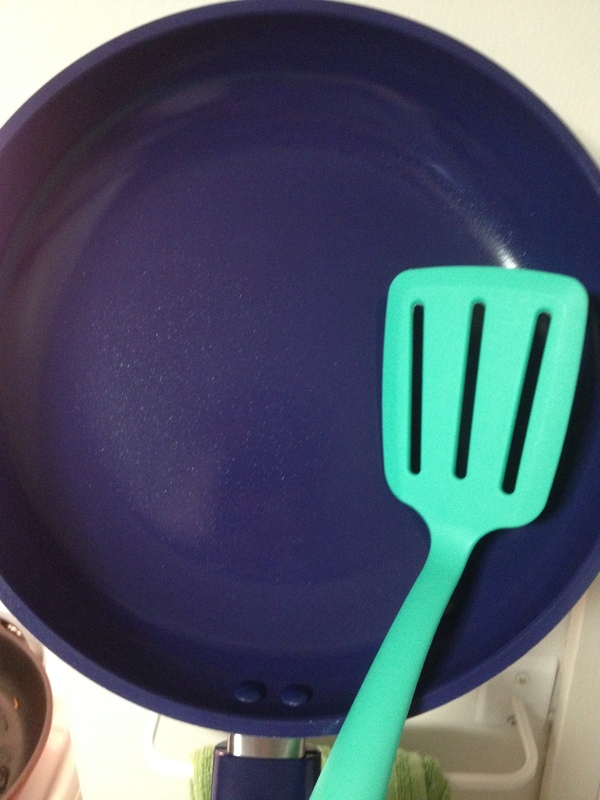 Luckily the melted plastic came off the frying pan when I washed it and the melted part of the handle doesn’t affect the usability of the flipping thingy (I really need to figure out what that thing is actually called lol) so I can still use both my new kitchen tools. The flipping thingy just doesn’t look quite as nice as it once did, ya know, two days ago *rolls eyes*.